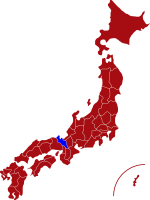 Kyoto prefecture is located in the heart of Japan and is known for its beauty and cultural significance. Kyoto was the capital of Japan from 794 to 1868 and is one of the most popular tourist destinations in country. The city has been described as the cultural and historic centre of Japan and is home to many traditional shines, temples and beautiful Japanese gardens. Gion district is one of the most popular areas in Kyoto and where you can catch a glimpse of Geiko (Geisha) and Maiko (apprentice Geisha) in traditional Kimonos strolling through the streets. Gion is also known for the Gion Matsuri, which is held during the entire month of July and is regarded as the most famous festivals in Japan. On the northern side the city is Miyazu Bay and the Amanohashidate (bridge to Heaven), a breathtaking 3 km strip of land crossing the bay, is regarded as one of the three most scenic views in Japan. West of Miyazu is the city of Kyōtango, home to the beautiful Kotohiki Beach, with its many restaurants specialising in delicious crab dishes, and the Kyogamisaki lighthouse, which provides stunning views over the Sea of Japan. For more information about Kyoto prefecture, see their official tourism website. Air - The closest international airport from Kyoto is Kansai International Airport. The journey time to Kyoto by Airport Limousine Bus is around 90 minutes. Click here for its English website. The nearest airport for domestic flights is Osaka International Airport, also known as Itami Airport, which is less than an hour by Limousine Bus. Click here for its English website. Rail - There are regular "bullet trains" from Tokyo and journey time using the high-speed "Nozomi" Shinkansen is 2 hours and 20 minutes. 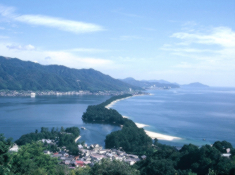 Amanohashidate is a 3 kilometre-long sandbar covered wih over 8,000 pine trees. It is regarded as one of the three most scenic views in Japan and a "must see" attraction for visitors to Kyoto. 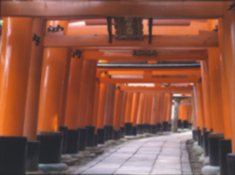 Fushimi Inari Taisha Shrine is one of Kyoto's oldest shrines dating back to 711 AD. The shrine is famous not least for its seemingly never ending row of orange coloured torii gates that lead up to the top of the forest offering stunning views over the city. 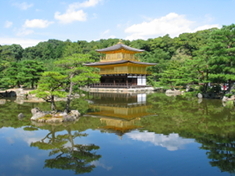 Kinkaku-ji or "Golden Pavillion" as it is also known, is one of Kyoto's famous iconic landmarks and one of the most photographed sightseeing attractions in Japan. 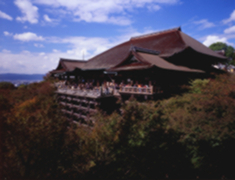 Kiyomizu Dera dates back to the end of the 8th century and is widely regarded as one of Japan's most famous Buddhist temples.